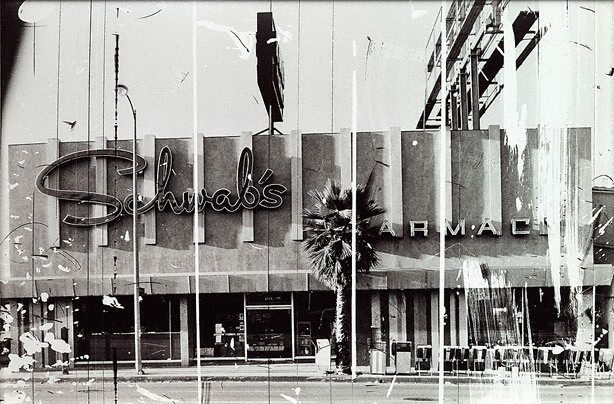 The buildings and shop-fronts of West Hollywood’s Sunset Strip have been faithfully documented by the American artist Edward Ruscha every two or three years since 1966. These images are the scratched and marked reworkings of images from his 1966 photo-book, ‘Every building on the Sunset Strip’. The book followed on the success of his earlier pioneering photo-books, ‘Twentysix gasoline stations’ 1963, ‘Various small fires’ 1964 and ‘Some Los Angeles apartments’ 1965. The photographic panorama of the Strip, which was itself published in strip form as an 8.2m long foldout, had a particular impact on the architect Robert Venturi. Venturi recreated a version of Ruscha’s work in his book, ‘Learning from Las Vegas’ 1972, which introduced a postmodern perspective by critically assessing consumer culture through the built environment of Las Vegas. Signed and dated centre verso, "... Ed Ruscha 1976-1995". Bronwyn Clark-Coolee, Photography: Art Gallery of New South Wales Collection , 'Not 'simply' anything', pg.266-287, Sydney, 2007, 271-2, 281 (illus.). Julianna Engberg, Downtown: Ruscha, Rooney, Arkley , 'Downtown: Ruscha, Rooney, Arkley', pg. 10-20, Bulleen, 1995, 10-20, 14 (illus. ).